Hearts claimed their second successive victory at newly renovated Tynecastle as they survived a second-half Dundee fightback to increase pressure on the top six. Neil McCann continued in his struggle to identify a coherent system, changing formation after failing to get a foothold in the game not for the first time this season. They began the game in a 3-4-2-1 formation up against Hearts’ functional 4-4-2. Mark O’Hara and Jon Aurtenexte were deployed as wing-backs, with Scott Allan and Roarie Deacon as the roaming support cast behind Sofien Moussa. The away side struggled to penetrate Hearts in the first-half as countless misplaced passes and an imbalanced shape made it simple for the Gorgie team to negate Dundee’s focus on central areas. Hearts denied goalkeeper Elliot Parish from playing out from the back by pressing high, with the escape route often coming from O’Hara dominating Lewis Moore in the air. When Dundee did establish possession in their own defensive third, however, they were often forced long due to the pressure applied by Hearts. The ball was being launched from too deep and before the other centre-backs had tucked in to cover the gaps that were there should Hearts win the aerial contest. The positioning of Kerr Waddell as a facilitator to switch play, while a good idea in principle, was a minor experiment that when executed proved a hindrance more often than not. Below, Jack Hendry has received possession as the right centre-back but Isma Goncalves and Cole Stockton are aiming to prevent the ball from being shifted to the far side. As Hendry was forced inwards, Waddell stepped into a midfield position in order to create space for the direct switch to Josh Meekings, while also offering a passing option centrally to break the line of pressure. On this occasion his position did occupy Stockton and forced hi to drop and allow the ball to be played across but often he got too close to the ball carrier and confused the player in possession by overcrowding the area they were in. Deacon has flattered to deceive since making the move north from Sutton United. He was asked to play narrower than usual along with Allan in order to receive the ball in front of the Hearts back-line where they could outnumber the central midfield pairing of Arnaud Djoum and Prince Bauben. Hearts held a high line throughout and close the distance between the lines well, which made this difficult to achieve for Dundee. Anthony McDonald and Moore tracked Dundee’s wing-backs until they were in danger of dropping into a back six. Hearts’ two full-backs, Michael Smith and Rafal Grzelak, were left spare but were wary of how focused Dundee’s attacking threats in the centre of the park and so narrowed in to provide cover for Christophe Berra and John Souttar. McDonald, in particular, allowed Aurtenexte to continue his run in order to maintain a position in which to counterattack. 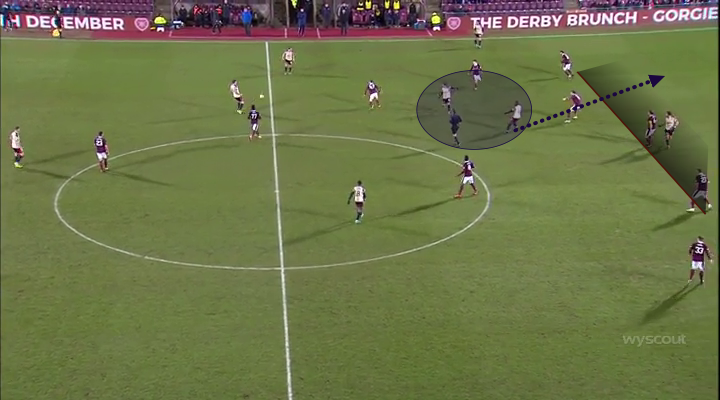 Glen Kamara, the main instigator of Dundee’s attacks, failed to exploit the room afforded on the outside of the full-back by opting to force the ball through central channels rather than switching the play. Harry Cochrane came on for Djoum just over half an hour into the game due to injury and was drawn to the ball in certain incidents due to his natural inclination to press. Allan tended to drift in from the left to find pockets to operate in but he and Deacon’s lack of awareness of each other’s movements meant that they were often found cancelling one another out. Hearts were comfortable with dealing what was in front of them and Dundee never looked to threaten in behind, despite the room given up by Hearts’ high line. As the half progressed, Dundee gradually took control of possession but the lack of structure in their attacking positioning led to arbitrary forward runs that left a huge gulf from front to back. 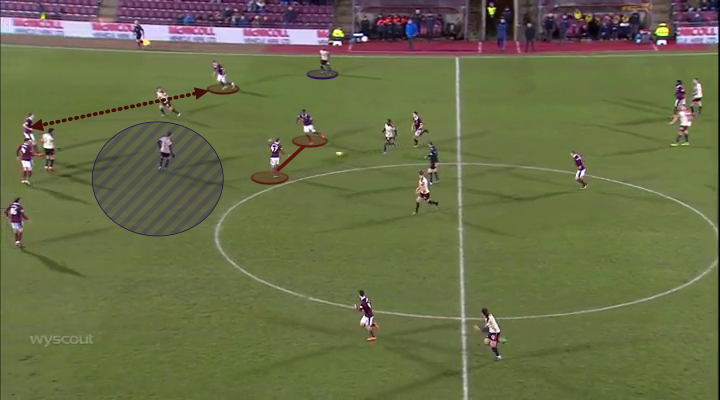 Hearts’ man-orientated system in the midfield third led to a scenario where six Dundee players were horizontally aligned, alongside seven maroon jerseys. Reminiscent of Arsenal versus Manchester City earlier in the season, this situation left Hendry with only one passing option due to the lack of variation in the distances from the man on the ball. McCann switched to 4-2-3-1 at half-time, sacrificing Hendry for captain Cammy Kerr. Dundee were transformed after the break, and found great joy down the right flank as Dundee caused Grzelak a lot of problems. There was a distinctively more solid base to Dundee as O’Hara and Kamara sat behind Paul McGowan. Allan was given license to take up positions from which he could turn and influence the game and, for the opening twenty minutes of the second period, he caused Hearts major problems. 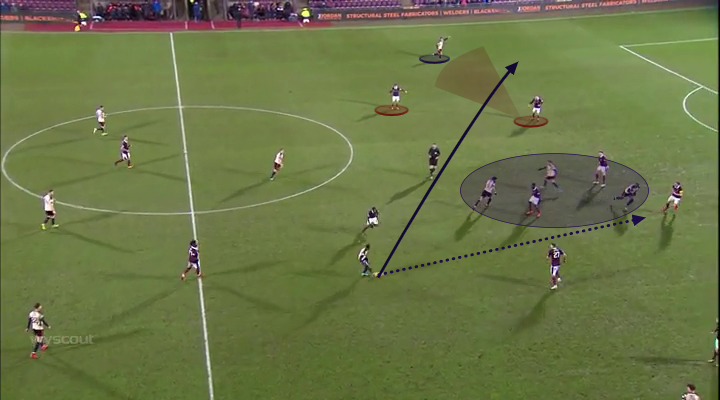 There had been a lot of turnovers of possession in the first 45, but in the second, Dundee’s set-up gave them a quick option to launch a counter attack as the pitch was less congested with Hearts dropping deeper as the game progressed. Allan’s final ball let him down when he did receive the ball in these areas, but the introduction of wingers provoked Grzelak to edge out towards Deacon and open up space between him and Berra. Levein sought to shore up the midfield by switching to a 4-1-4-1 with Ross Callahan joining Cochrane in front of Buaben. The move did indeed give Hearts an extra solidity, and allowed them to retain possession better than they had with two forwards on the park as the emphasis had been on playing directly too often. Callahan’s runs from deep were a threat late on as twice he managed to run off O’Hara at the halfway line to be played through on goal after Stockton had held up the play well. McCann lambasted his side’s performance, describing it as one of their worst performances this season. Dundee lacked vigour on an individual level but the Dundee manager must establish a consistent shape that he believes gives his creative players the best platform to implement the passing game he strives for. Hearts didn’t have to get out of second gear to take the three points, and that’s what will be his biggest frustration.